Love chocolate, but not so much sugar? 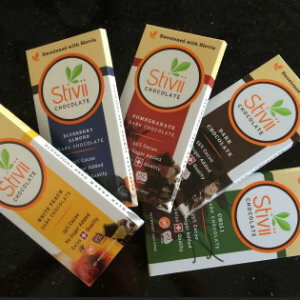 We just discovered Stivii’s premium dark chocolate sweetened with Stevia, a natural zero-calorie substitute for sugar. They taste like heaven—if you love dark chocolate—and can satisfy any sweet tooth while providing 25% fewer calories than traditional dark chocolate. Made with 55% cacao, they’re dairy and soy free, vegan, high in fiber, and some are made with real fruit pieces instead of juice powders or artificial flavors. The flavors include Original Dark Chocolate, Pomegranate Dark Chocolate, Blueberry Almond Dark Chocolate, White Peach Dark Chocolate, and Chili Dark Chocolate. Stivii’s Chocolates are available locally at The Cheese Shop at The Mix in Costa Mesa and Gelson’s Markets. The newest and most exciting concept for fashion followers, Atelier 7918 just opened at Crystal Cove Shopping Center in Newport Beach. Owner and founder, Annemarie Brandi hand selects hard-to-find established, independent, and newly launched designers to provide a local resource so you can find stylish pieces before they’re trending. Collections range from ready-to-wear, accessories, jewelry and beauty products including coveted brands such as Mary Katrantzou, Peter Pilotto, Mugler, Cushnie et Ochs, Olympia Le Tan, Laurence Dacade, Mugler, M2Malletier, Delfina Delettrez, Malone Souliers, Jennie Kwon, Ruifier, Kiyoko, Clark’s Botanicals and Kelly Wearstler, to name a few. The boutique was exquisitely designed in collaboration with emerging Italian architect Alessandro Pasquale to create a fashion sanctuary for fashion enthusiasts. 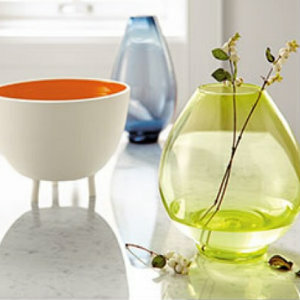 The price ranges at Atelier 7918 range from $15 to over $10,000, so there’s something for everyone. Atelier 7918 makes hard-to-find special pieces more accessible. You're invited to an evening of craftsmanship and conversation on Friday, October 2 at South Coast Village's Room & Board from 6 to 8 p.m.
Jaime Derringer, founder and executive editor of online design magazine Design Milk, and Jackson Schwartz and Joe Limpert, glassmakers and co-founders of Hennepin Made, a Minneapolis-based partner of Room & Board, will come together to discuss American craftsmanship and the process and inspiration behind creating handcrafted products. Bring a friend and enjoy light bites and beverages. Room and Board is at 1661 Sunflower Ave. in Santa Ana. Boxfli, simply the coolest shipping shop in OC, with two locations in Mission Viejo and Costa Mesa, is transforming the shipping process one colorful box at a time. They offer a rainbow-colored selection of boxes in all shapes and sizes in store or now online, as well as patterns that include bold stripes, modern-art style lips, preppy argyles, seasonal styles and more. 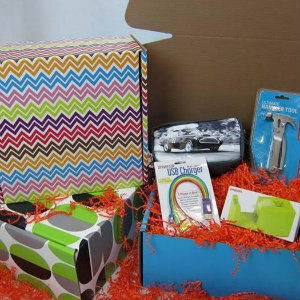 With college kids leaving for school, now is a great time to stop by Boxfli and send a custom care package from home. They even have school colors that can serve double duty as storage in tiny dorm rooms or small apartments. Boxfli makes it easy to create different care packages set up based on a student’s needs, using Boxfli’s unique novelty section (most of the items are $10 and under). You can choose from colorful pencils and other desk essentials, notebooks with inspiring sayings, creative paperclips. For girls, they have Emjoi mirrors, cosmetic bags, party games, gum in retro packaging, fun balloons, sparkly nail files, selfie stick. For techy students, they have Portable charging station, LED watch, rainbow colored USB cords, a cord organizer, single mutli outlet(Electro man) money soap (with real money). Boxfli also offers mailbox rentals, full service shipping and packaging. 23981 Alicia Pkwy, Ste. 180 in Mission Viejo. 949.595.0424. Just in time for your summer beach days, you need to know about this great local beach umbrella company. 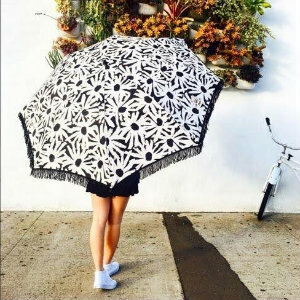 Local owner/designer Shelley Arends recently created the boutique brand Beach Brella Laguna Beach, to share her love of the SoCal beach lifestyle – surfing, relaxing, celebrating, soaking in the views, and always making time to put her toes in the sand. The brand’s mantra: “MADE IN SHADE” sets the tone for these 60-inch diameter brellas that will put a smile on your face and are easy to spot on the beach.. Each brella is handmade and hand-sewn, fashionably designed and colorful with boho-chic fringe. They are 100% UV protective, fade resistant 100% sueded micro fiber polyester with a DWR water repellent coating. They come in a fashionable beachy, carrying case with sturdy shoulder strap. They are lightweight and easy to carry, total weight with carrying case is 5lbs. You can find them in local shops such as Diane’s Beachwear in Huntington Beach; The Shop in Laguna Beach; Hobie Surf Shop in Dana Point, San Clemente, Laguna Beach, and Corona del Mar; Millie’s/Coastal Accents in Dana Point; and Love Lola in Newport Beach. You can also find them on Amazon, and online at beachbrella.com. 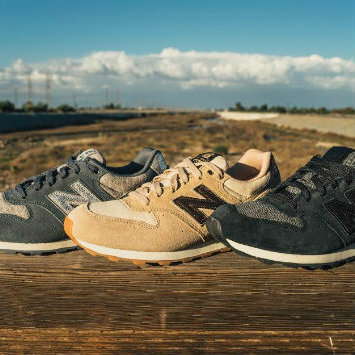 When it comes to function and fashion in athletic footwear, it’s hard to beat New Balance, a 100-plus year old company that proudly makes its high quality shoes with utmost care and performance technology in the U.S.A. and offers a variety of widths, a departure from other brands. At the New Balance at South Coast Plaza, we’re loving the newest look for women. The 696 is a sporty and chic retro shoe that features suede and mesh in on-trend colors like chambray with navy; suede with herringbone and other great color combinations. Some even feature sparkle elements. New Balance pulled the 696 shoe from the style archives for its low-profile look and comfy fit that’s perfect to pair with skinny jeans, or even a skirt. You'll love its sleek silhouette and the premium suede design — ideal for fall. Level 3, South Coast Plaza, in the Crate & Barrel Wing. 714.434.9405.